Renewal by Andersen®, along with its parent company, Andersen® Corporation, is the first window manufacturer to receive the Green Seal Certification for Environmental Stewardship. This is proof of the company’s commitment to ensuring that it continues to have a lasting impact on the environment. Read below to find out how the company deals with the many environmental challenges that we face today through the manufacturing and installation of windows and doors. Many companies today pursue energy efficiency solutions, and Renewal by Andersen is no exception. It believes in continually improving materials and windows and doors manufacturing process. The hope of homeowners to lower their energy consumption while achieving comfort and savings is realized through its retailers across the United States, including Renewal by Andersen of St. Louis. Renewal by Andersen contributes to improving the quality of indoor air. In fact, it is the only window company that has an Indoor Advantage™ Gold certification from the Scientific Certification Systems (SCS). This means that all manufactured and installed window and door units adhere to the strictest indoor air emission standards. Renewal by Andersen manufactures products that use recycled materials. The Fibrex® composite framing for doors and windows combines reclaimed wood fibers and PVC. This makes the material durable and low maintenance. The High-Performance™ Low-E4® glass, which blocks harmful ultraviolet (UV) rays and cuts down on noise pollution, is made from at least 12% reclaimed glass. The company minimizes landfill waste by manufacturing windows and doors that are built to last. Its products have extensive lifespans and are backed by the best warranties. 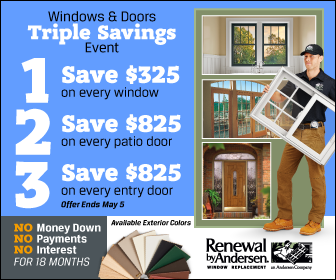 It’s no wonder many homeowners choose Renewal by Andersen when they replace their old windows or doors. With these environmental solutions, they, too, have become part of creating a positive impact on the environment. So, the next time you consider pursuing a home remodeling project for your home, be sure to contact Renewal by Andersen of St. Louis. To learn more about the many window and door options we offer, give us a call at (314) 332-2364, or fill out our contact form. We serve St. Louis, MO, residents.